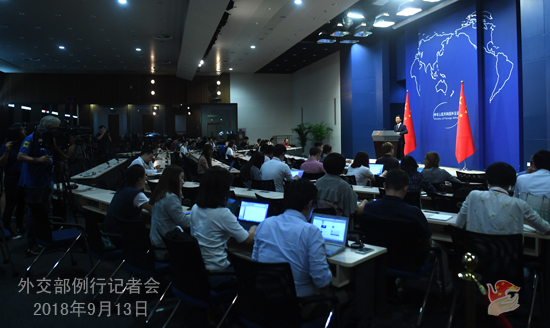 Q: We have noted that China has released information about Venezuelan President Maduro's visit to China. What has been scheduled for President Maduro's visit and what is China's expectation? A: At the invitation of President Xi Jinping, Venezuelan President Maduro will pay a state visit to China on September 13-16. President Xi Jinping and Madame Peng Liyuan will hold a welcoming ceremony and banquet for President Maduro and First Lady Cilia Flores. President Xi Jinping will hold talks and witness signing ceremony with President Maduro. Premier Li Keqiang and Chairman Li Zhanshu will meet with President Maduro on separate occasions. The two sides will have in-depth discussion on China-Venezuela relations and issues of mutual interest. President Maduro will also attend the closing ceremony of the 16th meeting of the Mixed Venezuela-China High-Level Committee. Relevant departments and enterprises on the two sides have conducted several rounds of discussions on the visit outcomes. The remaining details are being ironed out. We will release them in time. China believes that this visit will enhance bilateral mutual trust, deepen mutually beneficial and friendly cooperation in various fields, and elevate and open up new prospects for China-Venezuelan comprehensive strategic partnership. Q: US Director of the National Economic Council Larry Kudlow said that the US is proposing another round of trade talks with China. What is China's comment on this? A: I wonder if your colleague is now sitting at the press conference of the Commerce Ministry (journalist nods). What I can tell you is that China did have received invitation from the US side. We welcome that. Our two sides are discussing relevant details now. China always believes that an escalating trade conflict serves no one's interest. In fact, since last month's vice-ministerial consultations in Washington, the trade negotiating teams of the two sides have been in communication with each other in various ways, exchanging views on issues of each other's concern. Q: According to reports, President Xi Jinping and President Vladimir Putin visited the Ocean All-Russia Children's Care Center on September 12 on the sidelines of the Eastern Economic Forum in Russia. Do you have more details? What's the considerations for the attendance of the two heads of state at this event? A: I believe you may have seen relevant reports. It's true that President Xi Jinping visited the Ocean All-Russia Children's Care Center along with President Vladimir Putin in Vladivostok on September 12. The Ocean All-Russia Children's Care Center is a special witness for the exchanges between Chinese and Russian people. Following the major earthquake in Wenchuan in 2008, the Russian government invited around a thousand Chinese children from the quake-affected region to the center for rehabilitation. In 2013, hundreds of children from the area hit by earthquake in Ya'an, Sichuan were also invited to this center. At the center, they received the warm hospitality and attentive care from their Russian peers, and gradually forgot the pain they had suffered. Their experience has epitomized the fact that Chinese and Russian people always share weal and woe and lend support to each other. Friendship, which derives from close contact between the people, holds the key to sound state-to-state relations. The special arrangement of the two heads of state's attendance at this event of friendly exchange testifies to the high importance they attach to the traditional friendship between the Chinese and Russia people, which also makes a highlight of President Xi's visit. The two heads of state attended and delivered addresses at the ceremony commemorating the 10th anniversary of the hosting of Chinese children from Wenchuan by the Ocean All-Russia Children's Care Center, met with the Russian caregivers who hosted the Chinese children, the representatives of the Chinese boys and girls, and Russian children from across the country staying there. They also listened to their feelings about reunion, and witnessed the launching of the Declaration on Permanent Friendship between the Chinese and Russian Youth. As President Xi Jinping pointed out, this extraordinary event showcases that the great love cherished by the Chinese and Russian people has taken root, sprouted, blossomed and now bore fruits in our hearts. 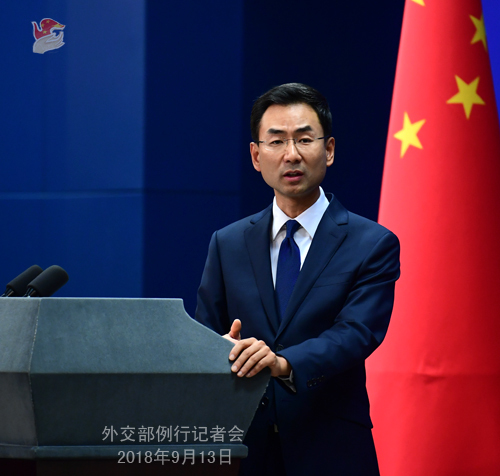 He encourages the youth of the two countries to serve as the backbone of their nation and envoy for friendship, and carry forward the long-standing China-Russia friendship. President Putin also expressed his hope that the Russian and Chinese youth will pass on the profound traditional friendship between the two peoples from generation to generation. China and Russia are good neighbors and good partners sharing common mountains and rivers and standing closely together like passengers in the same boat. We believe that under the auspices and care of the two heads of state, the streams of affinity and amity will continue to converge into a vast river of China-Russia friendship from generation to generation, making an inexhaustible driving force for the development of the comprehensive strategic partnership of coordination. Q: According to reports, Malaysian politician Anwar Ibrahim has said that Malaysia should initiate dialogue with China over allegations that China is holding Uyghurs in Xinjiang. He also said that other Muslim nations are free to speak up on this issue. What is your comment on this? A: I have not heard about the remarks you mentioned as made by the Malaysian side and need to check on that. As to the situation in Xinjiang, which is of much interest to you recently, I would like to say that it is a wish shared by people of all ethnic groups for Xinjiang to maintain enduring social stability and peace, since it serves their fundamental interests. Xinjiang enjoys social stability, economic growth and harmonious coexistence of ethnic groups. The sense of security and fulfillment for social stability of people in Xinjiang has been greatly enhanced. The series of measures implemented in Xinjiang are meant to improve stability, development, solidarity and people's livelihood, crack down on ethnic separatist activities and violent and terrorist crimes, safeguard national security, and protect people's life and property. Q: What is the viewpoint of the Chinese government about the political and economic situation of Venezuela? Is China considering some kind of economic aid during Maduro's visit to China? A: We have noted that after Venezuela smoothly had its presidential election, its domestic situation has been improving, marking a new stage of national development. The Venezuelan government has been pursuing economic and financial reforms which have been welcomed by its people. If Venezuela makes steady development, it serves the interests of all sides. 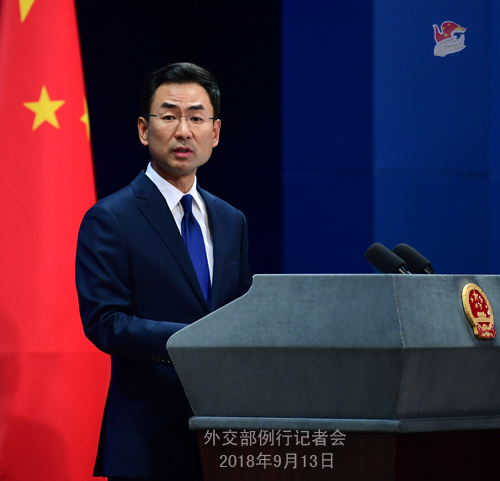 China believes that the Venezuelan government and people are capable of handling their domestic affairs within the legal framework. Venezuela is China's comprehensive strategic partner and important partner in economic and trade cooperation. Inviting President Maduro to visit China will help the two sides consolidate mutual trust, promote bilateral practical cooperation, and further advance bilateral relations. It will help Venezuela achieve steady development. Q: India media cited sources saying that Chinese military crossed the Line of Actual Control three times in a month into India's "Uttarakhand", the farthest one reaching 4km into India's "territory". What is your response? A: Chinese border troops always operate on the Chinese side of the Line of Actual Control in compliance with the relevant agreements reached between the two countries. What I have learnt is that the Chinese side was carrying out routine patrol on the Chinese territory. President Xi Jinping and Prime Minister Modi have met several times recently, during which important consensus was reached on properly managing differences and disputes and jointly maintaining peace and tranquility of the border areas. China and India also have well-established communication and meeting mechanism for border-related affairs. What's happened in the border areas could be dealt with through this mechanism. Resorting to the media to heat things up will not help control disputes. We hope that our two countries could work in concert to earnestly implement the consensus of our leaders and uphold peace and tranquility of the border areas. Q: According to reports, officials in Taiwan have said that China and the Vatican are close to making a deal on diplomatic recognition. Can you confirm it? I wonder if you have any comment on that? A: China and the Vatican have maintained effective contact all along. China is always sincere about improving its ties with the Vatican and has been making unremitting efforts to that end. We stand ready to work with the Vatican to ensure that our bilateral constructive dialogues and the improvement of bilateral ties could continue to achieve new progress. Q: Where exactly this allegation of transgression has taken place? You also spoke about the smooth mechanisms between the two countries. Has the issue been discussed between the two countries? A: According to what I saw from the media reports, some source on the Indian side said that the Chinese military crossed the Line of Actual Control into India's "Uttarakhand". But this is what an Indian source disclosed to the media. What I have learnt is that the Chinese side was carrying out routine patrol on the Chinese territory. Chinese border troops always operate on the Chinese side of the Line of Actual Control in compliance with the relevant agreements reached between the two countries. Follow-up: Has the issue been discussed between the two countries through the mechanisms established already? A: I have made myself very clear. For things like this, we hope that it could be dealt with through border affairs communication and meeting mechanism, instead of being hyped up by the media which runs counter to the spirit of the consensus reached by the two leaders. Q: Sri Lankan Prime Minister Ranil Wickremesinghe said in an interview to the CNBC on the sidelines of the ASEAN meeting of the World Economic Forum that Sri Lanka is not in a debt trap because of Chinese loans and it is not ceding control of its important ports to China. What is your comment? A: We have noted relevant reports. We welcome Prime Minister Wickremesinghe's words because we believe they are a forceful rebuttal to those baseless allegations that China is creating a "debt trap" in Sri Lanka, and Sri Lanka was forced to "sell" its ports to China. I would like to reiterate that China's assistance to Sri Lanka has no political strings, and China's investment and financing activities in Sri Lanka seek no political interests. China-Sri Lanka cooperation under the Belt and Road Initiative will not only benefit the two peoples but also contribute to regional economic development and connectivity. Q: Venezuelan Finance Minister said that China has agreed to a 5-billion-dollar credit line to be paid back in cash or oil. Can you confirm this and does China worry about not being paid back? A: We have said many times that financing cooperation between Chinese and Venezuelan companies is conducted on the basis of equality, mutual benefit, common development and market rules. All the loan contracts we have signed meet international standards and all the operations are legal and legitimate, and of course all the benefits belong to the people. At present, the relevant cooperation is going smoothly. Q: The United Nations Human Rights Council in its annual report named China as a country that "abuses human rights" alongside with Russia and some other countries. Does China have any response? A: As far as I know, what you mentioned is a report publicized by the Office of the United Nations High Commissioner for Human Rights (OHCHR). The China-related content in this report constitutes serious misrepresentation and interference in China's judicial sovereignty. The Chinese side has lodged stern representations and urged the UN human rights body to abide by the purposes and principles of the UN Charter, respect China's sovereignty, perform its duty in an objective and unbiased manner and avoid lop-sided views. We hope that under the leadership of the new High Commissioner, the OHCHR will seriously reflect upon and improve what it did. I shall stress that China is a rule-of-law country which safeguards its citizens' legal rights and interests in accordance with the law and support people from all sections in playing a positive role in promoting and protecting human rights. In the meantime, all persons are equal before the law and lawbreakers will be held accountable and punished. Any move to incite the separation of nation, challenge the state's political system and undermine social stability under the pretext of "rights protection" will be subject to punishment.